Simple baked oats with peanut butter. Mix all the ingredients together and bake for 30 minutes. The perfect breakfast for busy mornings. Everyone has a preference when it comes to oatmeal. I like my oatmeal really hot with a little brown sugar and cinnamon. My husband likes his oatmeal with brown sugar and a splash of milk and my youngest daughter likes hers with creamy peanut butter stirred in. Yep, peanut butter. 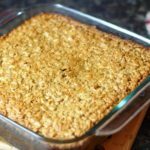 This time of year with all the hustle of the holidays, I love to make a simple and yummy baked oats recipe on busy weeknights. And the best part? It pleases everyone! 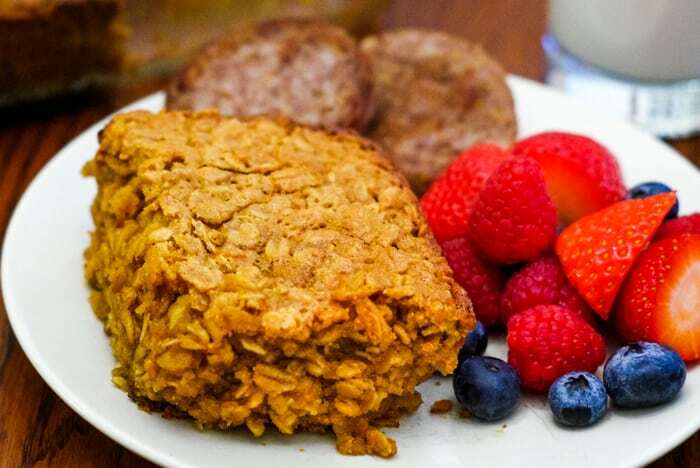 Peanut butter baked oatmeal has ingredients you most likely have on hand. 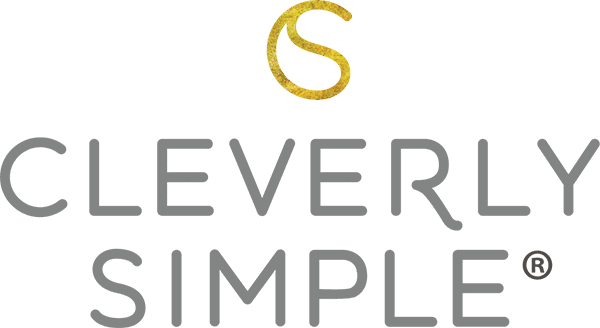 They are simply mixed together by hand (takes five minutes!) and baked. 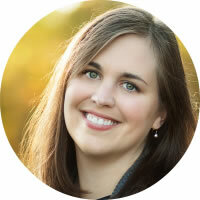 Are you ready to make some peanut butter baked oats with me? 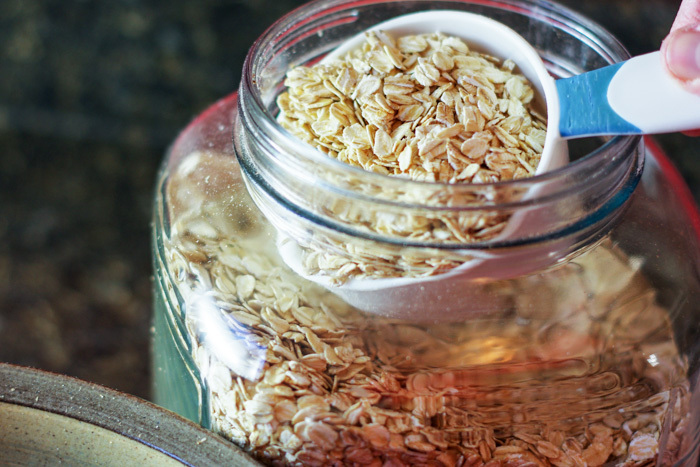 Combine quick oats, baking powder and salt in a large bowl. 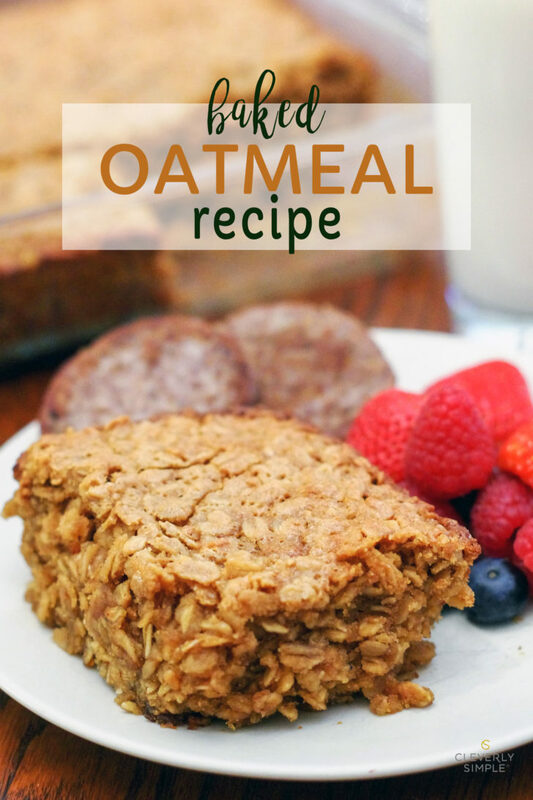 Here I am showing old fashioned oats, but this recipe is much better with quick oats! I didn’t have any on hand so I gave the old fashioned a try. I found that quick oats will hold together better after baking. If all you have is old fashioned oats, you can chop them up a bit in a food processor. Whisk together eggs, warmed milk, dark brown sugar, melted butter, creamy peanut butter and pure vanilla extract. Warm your milk so that the butter stays in liquid form. 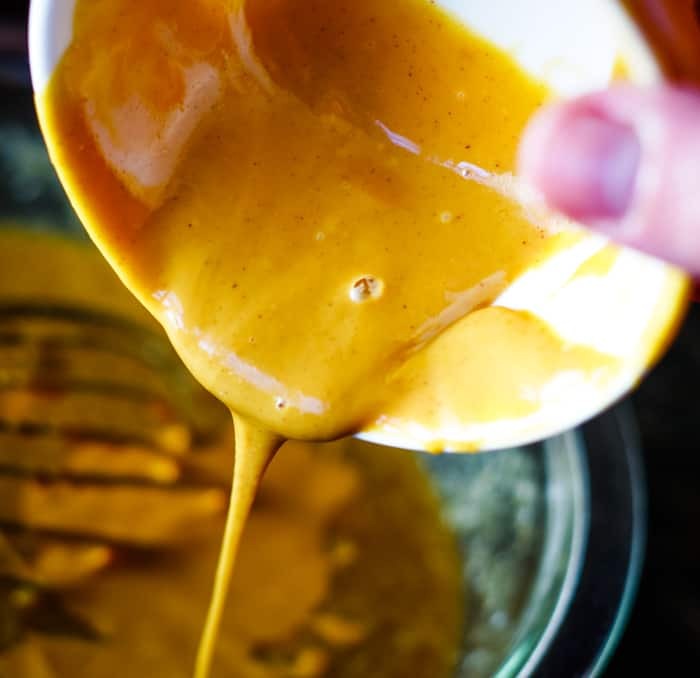 If you have cold milk, cold eggs and cold refrigerated peanut butter, your butter will start to solidify before baking. A little note about the peanut butter. With this recipe, I am assuming that you are using a natural peanut butter without added sugar. Our favorite brand has only two ingredients : peanuts and salt. Can you see the tiny specks of peanut in there? If your peanut butter has added sugar, you may want to decrease your brown sugar to 3/4 cup. 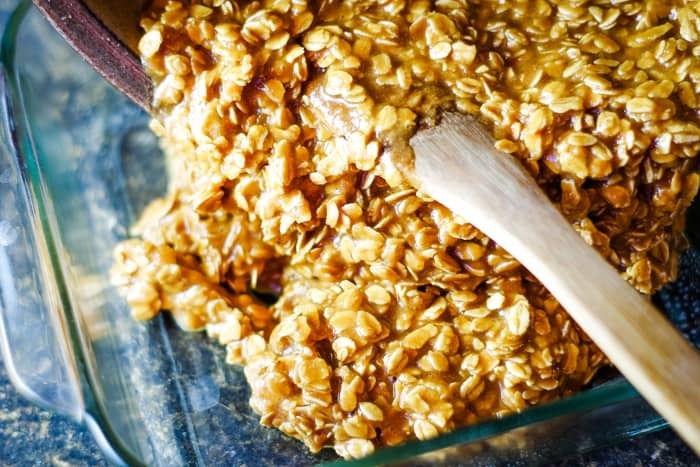 Combine your peanut butter mixture with your oat mixture and stir well. Allow the batter to sit in the bowl for 5 minutes. Pour the batter (it will be wet!) into a greased 8×8 pan and place it into a preheated 350˚ F oven for 30-35 minutes or until an inserted toothpick comes out barely clean and the edges are deep golden brown. Take a look at that! 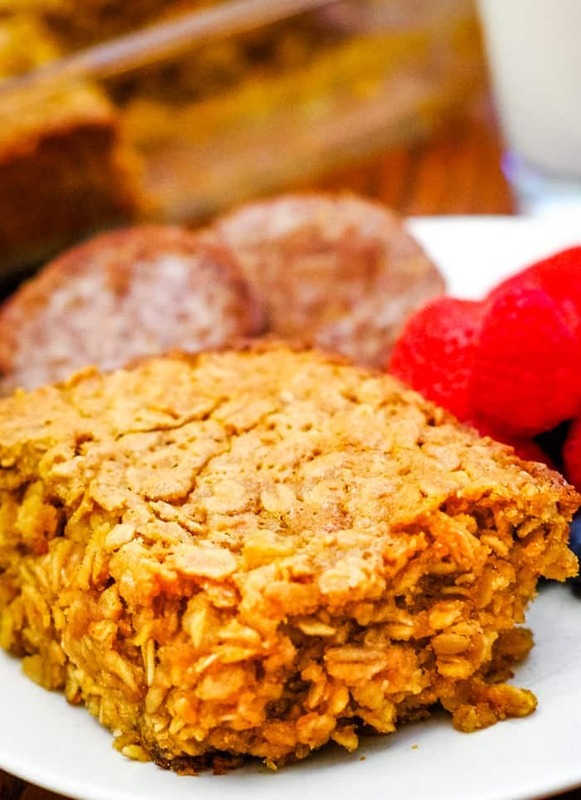 A sweet and salty oatmeal bake that smells soooo good. 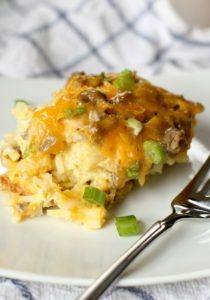 You can dig in right away with a spoon or wait until it cools enough to cut into 6-8 square servings. 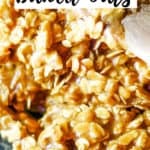 This Peanut butter baked oats recipe is a delicious way to get healthy oats and protein packed power into your dinner routine. We like it served hot out of the oven with crispy bacon or sausage and fresh fruit. A complete meal! Feel free to add whipped cream, sprinkles of powder sugar or a drizzle of maple syrup in the spirit of Christmas. Can I make this recipe dairy free, egg free and/or gluten free? 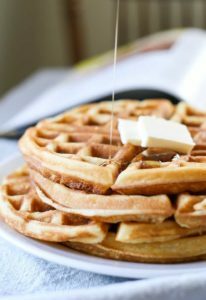 This recipe can also be made with all kinds of substitutions like non dairy milk, flax eggs and/or coconut oil for the melted butter. I dare say you could even use almond or sunflower butter in place of the peanut butter. There is naturally no flour in this recipe, so it is also gluten free. How long does baked oatmeal last? Once baked and enjoyed, refrigerator the leftover in an airtight container for up to 5 days. How do I reheat the baked oats? You can reheat them in the microwave. However, they have the best taste and texture the first day. Do I eat these baked oats warm or cold? I enjoy them warm but they are equally delicious cold. 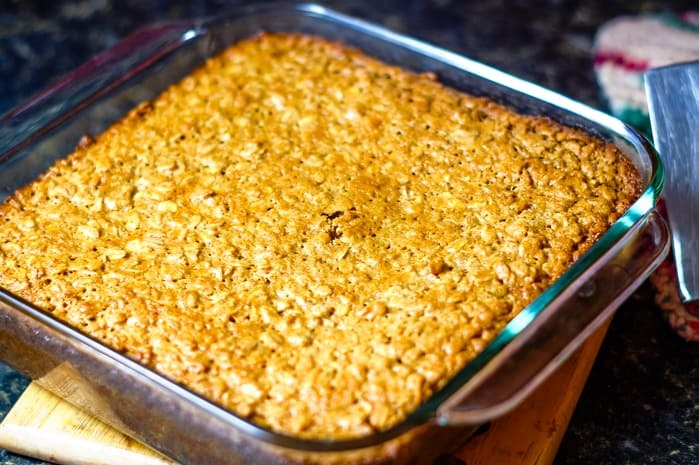 Baked oats recipe made with peanut butter and vanilla. 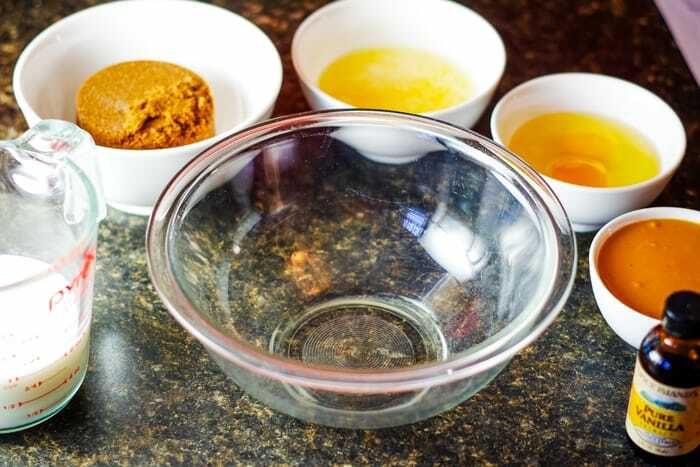 In a smaller bowl, whisk together 2 eggs, 1 cup warm milk, 1 cup dark brown sugar, 1/2 cup melted butter, 1/2 cup creamy peanut butter and 1 tsp. pure vanilla extract. 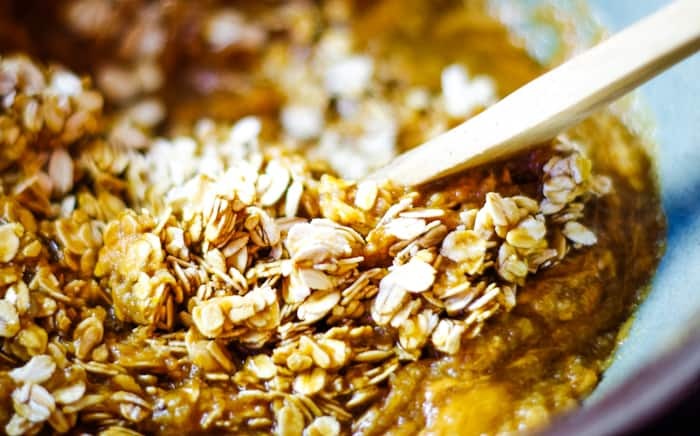 Combine your peanut butter mixture with your oat mixture and stir well. Allow the batter to sit in the bowl for 5 minutes while you preheat your oven to 350 degrees. 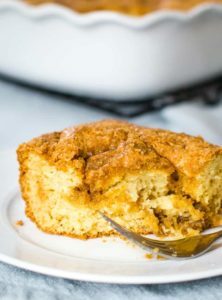 Pour the batter into a greased 8×8 pan and bake for 30-35 minutes until an inserted toothpick comes out barely clean and the edges are deep golden brown. Serve warm and enjoy plain or with cream, powdered sugar or maple syrup. I love baked oatmeal, but I’ve never tried adding peanut butter to mine. 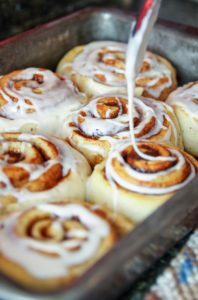 I bet my son would love these, too — what a great make ahead breakfast for rushed mornings when we’re running late to preschool!